World map is very useful tool to understand geography, world map is used to locate international boundaries, location of places, to plot population, world map also use to know about geology and soil type. World map divided into two major categories general and thematic. The political world map and physical world map come into general and maps with specific theme come into thematic such as climate and bio geographical.to locate mineral and gold we use map, agricultural map, climate map, rainfall map to measure rains, air rout map for aeroplanes, world earthquake danger zone map to understand the area under earthquake zone, world forest, wildlife and national paks map, fisheries map, natural resources map to locate the important resources, language map to devide the world through language, litracy map, rivers map, temperature map to understand the climate and some other purpose. When we need actual area and distance of a map we use scale. Linear scale is popular way to get actual area measurement. The line is marked off in units representing the real distance of the map given in miles and kilometre. The latitude and longitude play the major role for location of an area; these are the horizontal and vertical lines all over the map create geographical coordinates called latitude and longitude which measure area of world or earth sphere in degrees and shows angular distances. Conventional symbols used on maps to show any map feature, such as green for forest, and animal shapes for particular wildlife areas. Some important world maps are shown. 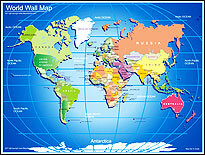 World map purpose is to show places on earth as they appear in their true location, in terms of latitude and longitude. 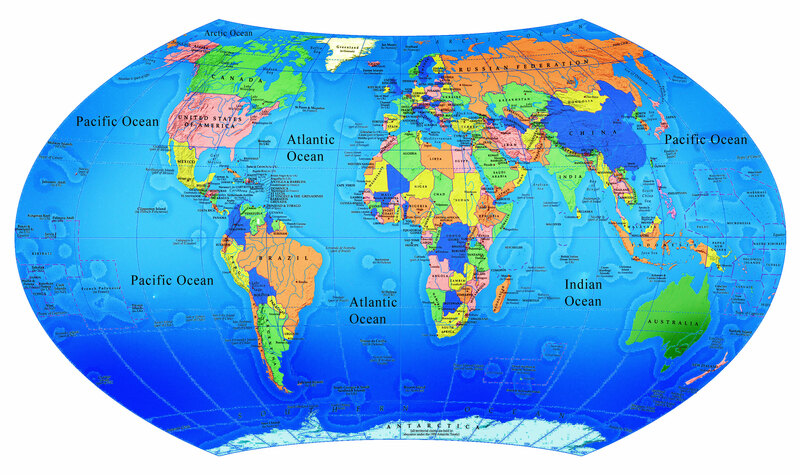 Cartographers use a technique of transforming the curved earth onto a flat surface that is called projection. It would have very difficult to project globe into flat map to preserve the accuracy of all aspects. The distortion of one can affect other properties of globe. So cartographers used three type of projection to show accuracy of different aspects of map. Cylindrical projections, conic projections and Azimuthal projections. Azimuthal projections transform the globe onto a flat circle such maps are useful for viewing hemispheres, continents and the polar regions. When World Map first created? A major figure in the history of world map is Christopher Columbus who was a reputed mapmaker. The history of cartography would be incomplete without the mention of Gerardus Mercator. He is credited with the production of the first world map in 1538. His system was a great achievement and is still used by people even today. There is unanimity on the fact that cartography came into being long before the advent of written language. In the sixth century, B.C. the Babylonians made the first attempt at preparing a world map. The ancient China made good progress in cartography. The maps prepared by ancient china are very accurate and detailed. While cities and villages the ancient china in circles, provinces are within squares. The maps of ancient china are also topographic, because these maps show mountain ranges, rivers as well as the South China Sea. The second century geographer Ptolemy was a notable figure in the history of cartography. He believed that the world is round. He was also of the belief that the sun revolved around the earth. Ptolemy will be definitely remembered for his contribution to cartography. Religion also played a significant part in the history of cartography. Christians' beliefs played significant part in the history of medieval maps. Devoid of any geographical value, the style of these maps was ornamental and symbolic. By the end of eight century AD, the maps now called T-O maps made their appearance. At that time only three continents were known - Africa, Asia, and Europe. These continents were separated by two rivers and the Mediterranean. In the beginning of the fourteenth century AD, the sea travel became more ubiquitous. Cosmographers were the first to undertake mapmaking as a business value. The globe made their appearance quite early in the history of cartography. Though the first globe is attributed to the ancient Greeks, the earliest extant globe was prepared by Martin Behaim of Germany in 1490. The world Globe including 5 continents Australia (Including Oceania), North America, Asia, Europe and South America. Africa: Africa is home to the world’s largest, the Sahara, which is spread on an area of approximately 3.5 million square miles. ASIA: Largest continent, Asia is most populous continent in the world. North America and South America: Occupying an area of 9,365,290 square miles, North America is the world's third largest continent, having 7% of world's population. The continent is home to Mount McKinley in Alaska. Christianity is the dominant religion in North America. Europe: The sixth largest continent in the world Europe is home to 46 countries. The continent is home to some territories and dependencies. Mt. Elbrus in European Russia is the highest point in Europe. the Caspian Sea is the lowest point in the continent. The longest river in Europe is the Volga, in western Russia. Germany is the most populated country in Europe. The smallest country in terms of population is Luxembourg. More than 47 languages and principal dialects are spoken in the continent. Countries: Very soon South Sudan will become the newest and 196th country in the world. Today there are 195 countries in the world. 192 of them are members of the United Nations. Vatican City and Kosovo are not members of the UN. There are many countries in the world that have multiple capital cities. We provide geographic information and maps about every country in this world. Apart from the counties, there are also over sixty Colonies, Territories, and Dependencies of independent nations. Forest: The total forest area represents nearly 30 percent of the Earth's landmass and is about 4 billion hectares. More than half of these forests are situated in tropical and subtropical areas. The uneven distribution of forest area is quite obvious. 60 percent of total forest area lies in seven countries. Planted forests cover is about 140 million hectares. The whole earth is covered by 65% of water.